Islamic Primary School has four teaching assistants. They serve as assistants to regular teachers or may offer one to one individual instruction. 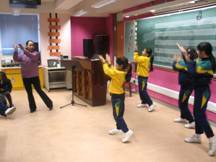 Teaching assistants also teach a variety of non-academic programs including: dancing; language instruction in: Hindi, Urdu and Nepalese; and general non-classroom supervision. Our teaching assistants make a valuable contribution to our educational programs. A number of students attending Islamic Primary School are Indian. As a result, it was felt that their program could be enriched by offering language classes in Hindi, the national language of India. Ms. Pooja, one of the school's teaching assistants, was recruited to work with the Indian children. Basic language instruction is provided and children are encouraged to make use of Hindi whenever possible. Islamic Primary School has a large number of students from Nepal. Accordingly, it was felt that offering instruction in Nepalese would further add to the diversity and enrichment of their academic program. 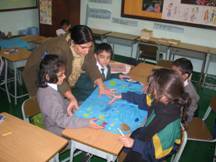 Nepalese teaching assistant, Mrs. Sunita Rai is responsible for the program. Students are grouped, based on their language ability. In addition to language instruction, Nepalese culture and tradition are also taught. Mrs Shahina Kausar has been working for many years. In addition, she has also been responsible for providing instruction to a number of our Muslim students. Here, the focus has been on basic Urdu and Islam.